It’s the origin of the Mime and Marionette. What caused them to be villains and to have the Comedian chasing them all the time? The origin and motivation issues do slowdown the narrative by focusing on subplots instead of the main narrative but this one is still interesting if not hard to believe. So, both Marionette and the Mime have been on the run and on their own since they were kids. That they have survived this long is almost impossible. A few things are unclear such as since when has the Comedian been chasing them. Next is how exactly does Mime’s invisible weapons work? He has shot them a few times to hurt people. Are they real or some form of telekinesis? If it is telekinesis, how come he has powers on the Watchmen’s Earth? Only Doctor Manhattan had powers. 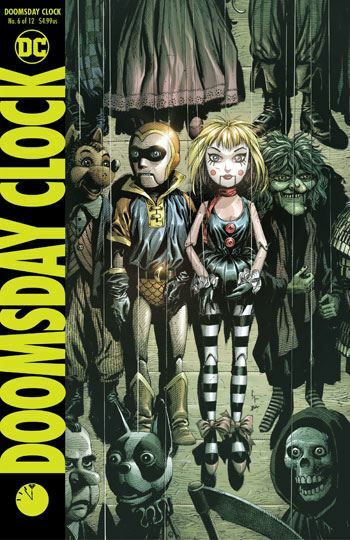 Mime and Marionette are Geoff Johns most important contribution to Doomsday Clock and because the story’s setup, they might be the only original characters introduced. Every other character is either an existing DC Comics character or a from the original Watchmen (and that includes the new Rorschach). I understand why Johns is investing so much in these two. True to form, they are more interesting than their original Charlton Comics counterparts, Punch and Jewelee. Let’s just hope that Johns can integrate them better in his narrative and that they are not just me-too characters. I don’t know if Gary Frank likes gore but there is a lot in his work. It is a regular feature of many postmodern comics. It’s still chocking. His strength is depicting emotions with eyes. This is important in the overall narrative as it seems that Johns is the one pushing the story. Examples such as Frank’s handling of emotion shows he is as invested in the work. It’s just that his contribution is not a easy to recognize.